Drivers looking for a dependable vehicle to get from point A to point B often choose a compact hatchback — the only problem is that in an effort to maximize fuel economy ratings, drivers often end up sacrificing engine power and space, both in the cabin and storage. 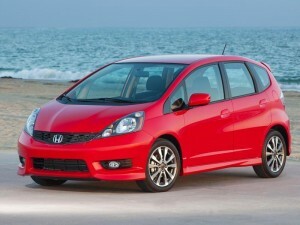 That’s why down here at Middleton Honda we’re proud to offer the 2013 Honda Fit. Both small and efficient enough to help you save big at the gas pump, we’ve been showing our customers how the Fit offers more space, convenience, and power to Orange County drivers than its competitor, the 2013 Toyota Yaris. Our friendly staff is here to help you make a responsible choice in a new car, and so we’ve put together a complete breakdown of the Fit and the Yaris so you can see for yourself! When comparing these two fine automobiles, the best place to begin is where the action is — under the hood. Both vehicles come equipped with a 1.5L 4-cylinder engine, but the Fit’s is markedly stronger, generating 116 hp and 106 lb-ft of torque while the Yaris only summons 106 hp and 103 lb-ft of torque. Drivers will be able to enjoy Fit’s additional power both in terms of speed and its ability to haul stored equipment. While the small size of the compact hatchback is certainly an advantage in city traffic, no one wants to feel constrained while they’re actually inside it. In this way, the Honda Fit’s design offers a much better driving experience. While both vehicles have very similar total dimensions, the Fit delivers more headroom, hiproom, and legroom for both the first and second rows of seats than the Yaris. Those who intend to take advantage of the hatchback cargo capabilities will find more cargo volume, and more maximum cargo volume than the Yaris as well. All Orange County residents have to do is test drive the new Honda Fit to see that driving a compact vehicle doesn’t mean you have to sacrifice comfort. Our showroom in Middletown is open seven days a week to make it easy for you find time to visit, so contact our sales department, and let us show you firsthand why Honda is a leader in compact vehicles.